Family Funnies / Great Laughs! Now and then, when in a reflective mood, I especially miss the presence of my parents, Alice and Alfred – both gone now for over twenty years. My sister and I being only siblings, and with relatives largely faded memories from our early Chicago past, we feel the loss all the more. For many reasons, we were blessed to draw the parents we did, and one aspect of their legacy remains particularly vivid and dear – their senses of humor. My mother’s laugh was as contagious as any disease known to man. When she got going, it rapidly escalated as the absurdness of the situation that started it in the first place grabbed full hold of her. At that point, it was impossible to resist, and my father was no help in that regard whatsoever since he and my mother were kindred spirits in that sense. Soon, anyone within range was consumed by tear-provoking laughter from which there was no exit – like being caught- up in a tornado vortex. Here are two memorable occasions that top the family laugh-list, and they both center on Dad and “fly”ing. My dad loved airplanes; he worked as a mechanical engineer for United Airlines for 37 years. When he retired, he took up radio-controlled model airplanes as a hobby. He had built model airplanes as a child and later, but the radio control aspect really hooked him late in life. The airplanes he built were works of art; he was the finest overall craftsman I ever knew…period. Whatever he designed, repaired, and/or constructed with his two hands was impeccably accomplished. So was the brilliant red and black sport-flyer he took out flying that day. 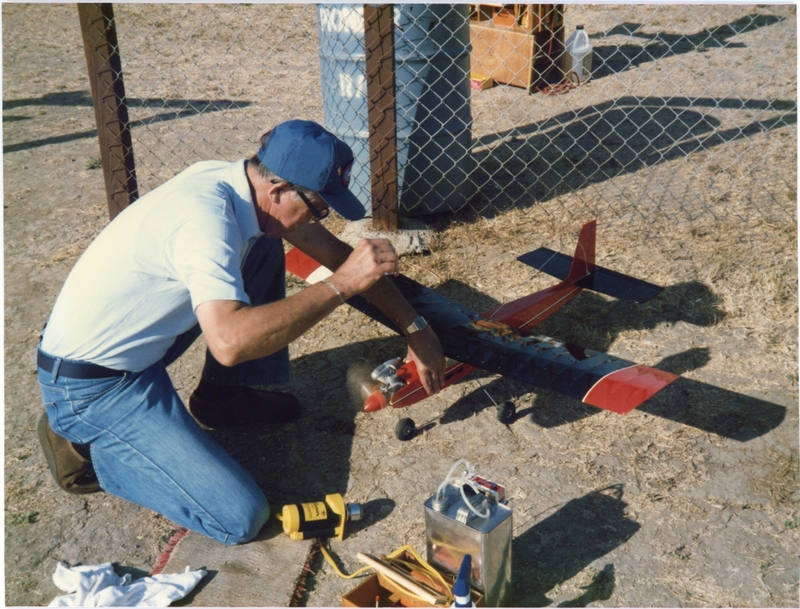 My mother, I, my wife, Linda, and our two daughters accompanied him to the nearby bay-lands RC field where he and other modelers of his local club gathered to fly. 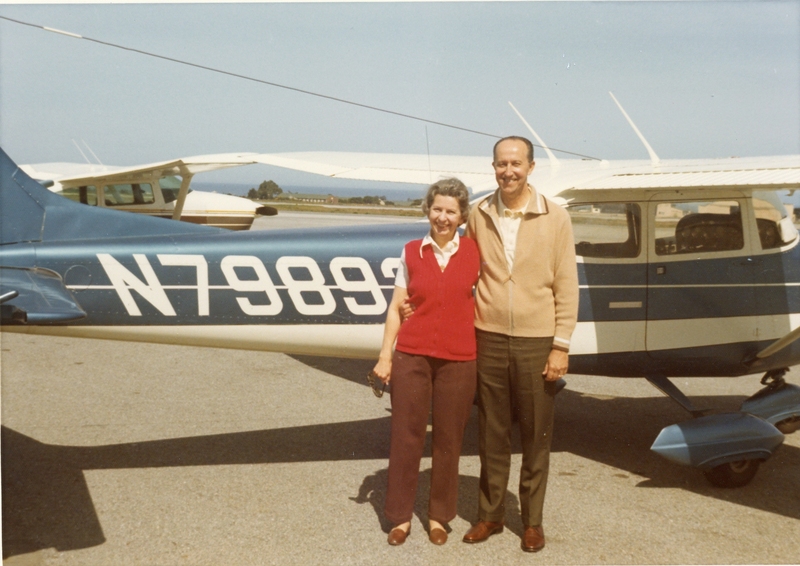 Dad fueled the plane, started up its mini-gasoline engine and began the take-off roll. The plane swept smoothly into the air, dad at the controls. I noticed as the plane began its first broad oval flight pass above the field in front of us that dad’s hands were a little shaky that day at the hand-held control box. Dad, like me, had shown a small-motor tendency toward “nervousness” through the years, plus, he was then in his late sixties which doesn’t help! He was also likely extra-conscious of us, his audience, that day. The plane was definitely acting a little “squirrelly” right after take-off. The airplane wavered in the air as it came around heading toward us on the second turn of its closed-oval path. Now the wings began to “waggle” even more as it responded to dad’s shaky hands. “Oh my God, it has missed the turn and is coming straight overhead, now!,” I cried silently. When that happens, it is easy to become dis-oriented at the controls – which is exactly what happened. As the plane passed directly overhead with dad still fighting the controls, I swung around 180 degrees in time to see it arch steeply upward and then immediately plunge straight down into the parking lot, disappearing from view behind the modeler’s shed directly behind us. We all ran to the parking lot; I knew the outcome would be ugly, praying only that nobody was killed in the parking lot by that sizeable plunging airplane. As we rounded the shed, there it was, a large radiating circle of splintered balsa-wood, two rubber wheels, and a bright red plastic nose “spinner” still mounted in front of the splintered wood propeller which was, in turn, mounted on the little engine all of which, as a complete sub-assembly, sat forlornly in the middle of the balsa-wood pile. Finally my mother rounded the shed, stopped, stared, and cried, “Oh Affie, it’s broken!” That probably was the greatest understatement of the facts I have ever heard in my life! As I stood there next to my father silently staring at what had been a beautiful airplane requiring many hours to build, a terrible tug-of-war raged in my heart and mind. On the one hand, I felt so sorry for my dad who was being very stoic; on the other hand, my mother’s severely understated response to the damage made me want to just bust out laughing. Luckily, I fought for and maintained my composure at that moment, but we all later laughed our way through an unforgettable lunch as we replayed the event over and over. Of all my family reminiscences, the most memorable and hilarious was the afternoon of “The Great Fly War” waged between Alfred, my father, and an anonymous fly which had found its way into my parent’s house one warm afternoon. Linda, I , and our two girls had just settled down for a late-afternoon dinner prepared by Alice, my mother. As we sat down to eat and began to pass food around the table, a pesky, uninvited fly decided to join us. After waving him off countless times, Dad started to become peeved. As we started eating, he abruptly rose to take action against this most annoying intruder, attempting to “herd” the little pest into the laundry room behind the kitchen where the door could be closed and the little bugger held prisoner while we ate in peace. As the rest of us continued eating, Dad succeeded in corralling this fly in the laundry room after considerable effort. 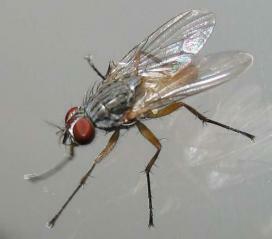 By this time, dad was really upset at this fly and came out of the closed laundry room to fetch the fly-swatter. Dad had had enough and decided he was going to have it out with the fly right then and there. As he headed back into the laundry room, fly-swatter in hand, the door closed behind him, and we all started to giggle and laugh. Dad was a lot like me, patient and stoic about large crises (stuff happens), yet impatient with little annoyances (that should not be happening!). He had now worked himself into a personal vendetta against this fly, and once Dad made up his mind, there was no turning back! Soon after the laundry room door closed behind him, we heard a loud WHAP! And then a loud WHAP-WHAP! And then some more WHAPS. 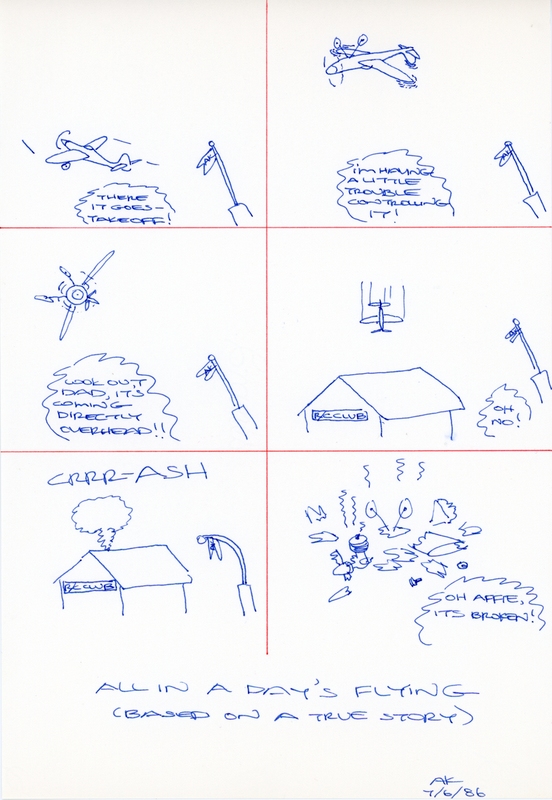 It wasn’t long before each subsequent WHAP-WHAP was followed by decipherable swearing….and then more and still more. By this time, my mother’s laugh-machine was turned full-on and we were all experiencing tears with each swell of laughter. Finally, it was quiet – the battle apparently over. We heard the door open and Dad appeared in the dining room with fly-swatter in hand and his always neat hair considerably mussed. One look, and we were laughing even harder – if that were possible. He triumphantly announced, “I got him!” I recall that our faces hurt so from all the laughter, that it was hard to chew our dinner. What a time! The food was great…but a little cold. Rest in peace Mom and Dad; we all love you and miss you!